The Alberta government and Blackfoot Confederacy have signed a new relationship agreement that will have both parties working closely on shared priorities. The Blackfoot Confederacy includes three First Nations in southern Alberta – the Blood Tribe, also known as the Kainai First Nation, Piikani Nation and Siksika Nation. These Nations have about 25,000 members. "I would like to thank the Premier and the Government of Alberta for agreeing to work with us and for recognizing that the Blackfoot have always been on this land. We look forward to working with the Alberta government through a shared sense of responsibility for making life better for all people and all Albertans." "Oki Niiksookowa, friends and relatives, fellow Siksikaitsitipii Chiefs and Councils, Right Honourable Rachel Notley, Premier of Alberta and Honourable Ministers. Today marks a historic moment in the relationship between the Government of Alberta and the Siksikaitsitipii Tribes in the signing of the protocol agreement. It carves a way forward in working together on matters that impact our tribes and the Government of Alberta. It is also worth noting that this is the first protocol agreement between the Government of Alberta and First Nations outside the Treaty areas in the Province of Alberta." "We would like to thank the Premier for the vision and courage she has shown, which has led us to sign this historic agreement. When Treaty 7 was entered into, it allowed for the completion of the CPR which linked Canada from coast to coast and enabled confederation and therefore Treaty 7 belongs to all Albertans. Today’s agreement demonstrates the political will which is necessary to explore commonalities and strengthen how we work together on a nation-to-nation basis. We look forward to exploring opportunities and to working cooperatively with the Government of Alberta to address areas of mutual benefit such as economic development and diversification for both the Blackfoot and all Albertans." Alberta is providing a $375,000 grant to the Blackfoot Confederacy to support the agreement’s implementation. The agreement will remain in place for as long as both parties wish to keep it active. This is the second protocol agreement signed by the Alberta government. 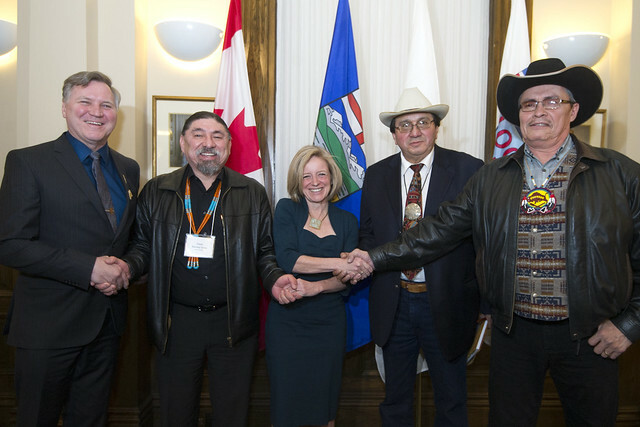 The Alberta–Treaty 8 First Nations Protocol Agreement was signed in April 2016.